A lot has changed in real estate in 2013. Home values have skyrocketed in many markets, mortgage rates have risen from their bottom and most recently, negative equity fell at the fastest pace ever. 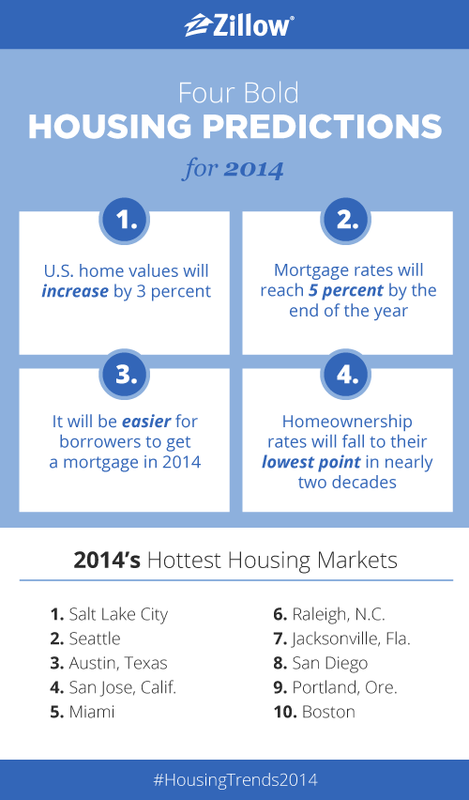 Zillow predicts 2014 to see a continuation of this positive trend. Take a look at Zillow’s four bold predictions for real estate and mortgages below, and the top 10 hottest housing markets for 2014. Do you think our predictions will come true? Let us know your thoughts on Twitter using the hashtag #HousingTrends2014.